As announced in March, The Queen, accompanied by The Duke of Edinburgh, will make a State Visit to Malta and attend the Commonwealth Heads of Government Meeting (CHOGM) in Valletta from 26th to 28th November. The Prince of Wales, accompanied by The Duchess of Cornwall, will also attend CHOGM in support of The Queen. They will be visiting for the CHOGM meeting and be accompanied by the Prince of Wales and Duchess of Cornwall. On arrival at Malta International Airport, Her Majesty and The Duke of Edinburgh will be greeted officially by the Prime Minister of Malta, The Honourable Dr. Joseph Muscat. The Prince of Wales and The Duchess of Cornwall will have arrived shortly before and will depart to follow their own programme. The Queen and The Duke will proceed to St George's Square in the centre of Valletta for a ceremonial arrival and welcome from the President of Malta, Her Excellency Mrs Marie-Louise Coleiro Preca, before arriving at the President's official residence at San Anton Palace. During the afternoon The Prince of Wales will attend the CHOGM Business Forum and The Duchess of Cornwall will visit Mdina Glass in Ta'Qali. On Thursday evening The Queen, accompanied by The Duke, The Prince and The Duchess, will host a reception for the People of Malta in the gardens of San Anton Palace. The Prince of Wales, President of The Prince's Trust, will later join guests at a reception to mark the launch of Prince's Trust International. The Queen, accompanied by The Duke of Edinburgh, The Prince of Wales and The Duchess of Cornwall, will attend the opening ceremony of the 24th Commonwealth Heads of Government Meeting at the Mediterranean Conference Centre in Valletta. After the opening ceremony, The Queen, accompanied by The Prince of Wales, will return to San Anton Palace to host a drinks reception and a lunch for new Commonwealth Heads of Government. The Duke of Edinburgh and The Duchess of Cornwall will depart the MCC for separate programmes. The Duke will first visit St Paul’s Cathedral for a short thanksgiving service and tour. From the Cathedral, The Duke will travel to the Casino Maltese for a Duke of Edinburgh International Awards lunch. The Duchess of Cornwall, Patron of Book Trust, will visit the "Read With Me" literacy programme at St Thomas More College Primary School, Zejtun, followed by a drumhead service and wreath laying ceremony at the Commonwealth War Graves Commission Capuccini Naval Cemetery, Kalkara. Following the New Heads lunch, The Prince of Wales will visit the Maritime Museum, Vittoriosa, to view an exhibition of the finalists of "Out of the Blue: The Prince of Wales's Commonwealth Environmental Photography Awards" and attend a discussion with youth delegates. His Royal Highness will then attend a Special CHOGM Executive Session on Climate Change. On Friday evening The Queen, accompanied by The Duke of Edinburgh, The Prince of Wales and The Duchess of Cornwall, will attend the traditional CHOGM dinner at the Corinthia Palace Hotel, Attard. The Prince of Wales and The Duchess of Cornwall will undertake a short engagement in Mdina before departing on Saturday morning. Following private farewells with the President, The Queen and The Duke of Edinburgh will visit Heritage Malta, Kalkara, where they will observe restoration work of historically significant paintings, books and textiles and watch a display of Maltese culture – both traditional and contemporary. From here The Queen and The Duke of Edinburgh will depart by boat to cross Valletta Harbour for the final engagement of the State visit at Marsa Racecourse, home to Malta Racing Club and Malta Polo Club. The Queen and The Duke will view events and present prizes before departing for Malta International airport and the official farewell. I always like that Charles and Camilla go with them on CHOGM trips, and it appears that they are doing their fair share of the work on this one. ^ I do believe that this may well be the Queen's last hurrah as far as attending CHOGM is concerned, unless one is held in Britain in the future. She has done a marvellous job all these years. We will see whether Charles eventually succeeds her as Head of the Commonwealth. With leaders of the 53-nation bloc discussing holding the next two biennial Commonwealth Heads of Government Meetings (CHOGM)in Malaysia and the South Pacific, her return to the Mediterranean island where she and Prince Philip spent some of their happiest days as newlyweds promises to be what one source called "a seminal moment" in royal history. The 89-year-old monarch has ruled out travelling long-haul as part of her efforts to tailor her workload to her age. So unless, there is a change in venue or the 2021 summit, when she will be 95, is in Britain or somewhere close, this is the last time she is likely to attend the two-yearly gathering of the Commonwealth's leaders. Apart from Malta, Cyprus is the only other Commonwealth country in Europe. The nearest after that would be in west Africa, which the Queen is unlikely to visit. A Buckingham Palace spokeswoman said: "I think this CHOGM was supposed to be in Mauritius, so I think we can never really determine where the CHOGM will be until it is on our doorstep. "I think we have said repeatedly that the Queen is not undertaking long haul travel so if the next CHGOM were to be somewhere definitely that was on the other side of the world or a significant distance away then the Queen would probably ask the Prince of Wales to represent her. A major security operation is under way in Malta this week ahead of the Queen’s State visit, as Europe remains on heightened terror alert in the aftermath of the Paris attacks. The Queen will arrive in Malta on Thursday for a Head of State visit, and will also launch the Commonwealth Heads of Government Meeting (CHOGM), which will be attended by 53 leaders from the Commonwealth countries. She will be accompanied by the Duke of Edinburgh, the Prince of Wales and the Duchess of Cornwall during the visit. Officials in the Maltese government have said that security around the Queen’s visit has been ‘beefed up’ as a result of the Paris attacks, which left 130 people dead. There will be no shortage of pomp and pageantry when the Queen arrives in Malta's fortress capital Valletta, on Thursday. She will receive a full ceremonial welcome in the historic St George's Square before greeting world leaders from 53 Commonwealth countries the following day. Yet this visit to the Mediterranean will also be a very much more personal affair. Because for the Queen, now approaching her 90th birthday, this is a journey to the past – to a time in the late 1940s and early 1950s that she has described as 'the happiest days of my life'. 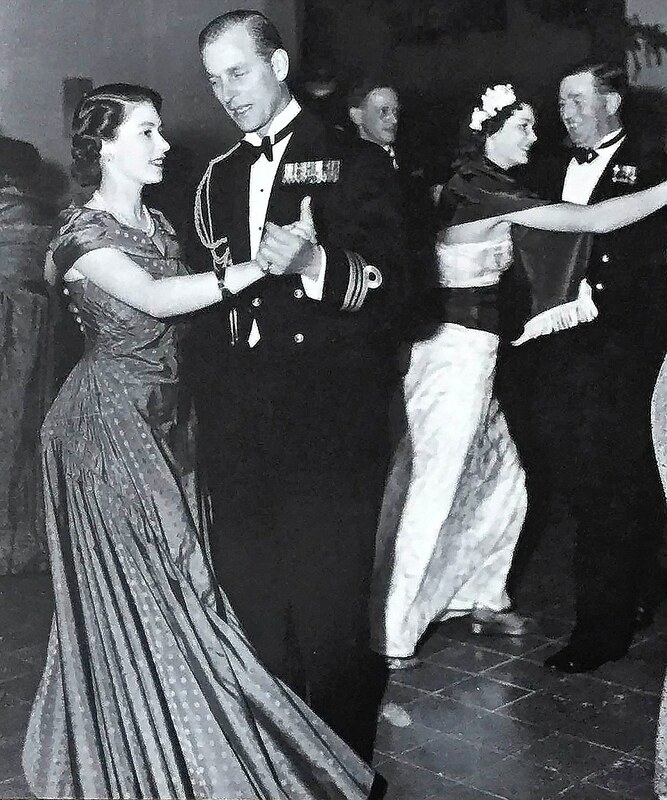 Away from the pressure of a watching public at home, Princess Elizabeth, as she then was, enjoyed a genuinely carefree existence on Malta – and the remarkable extent to which she was able to relax is captured in a series of photographs, many of which have never been published before. The Queen and Duke of Edinburgh are set to arrive in Malta later for a three-day tour. The royal couple lived on the island as newlyweds before the Queen's accession to the throne, and celebrated their 60th wedding anniversary there in 2007. The monarch will open the Commonwealth Heads of Government Meeting (Chogm) in the capital Valletta during the visit. 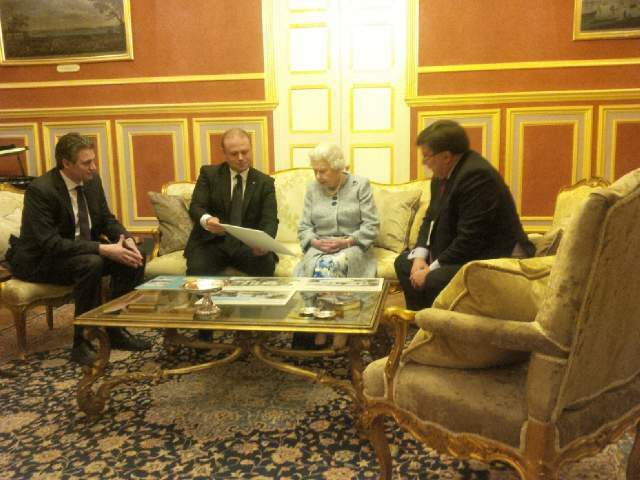 British High Commissioner to Malta Rob Luke said the Royal Family had an "enduring affection" for the country. 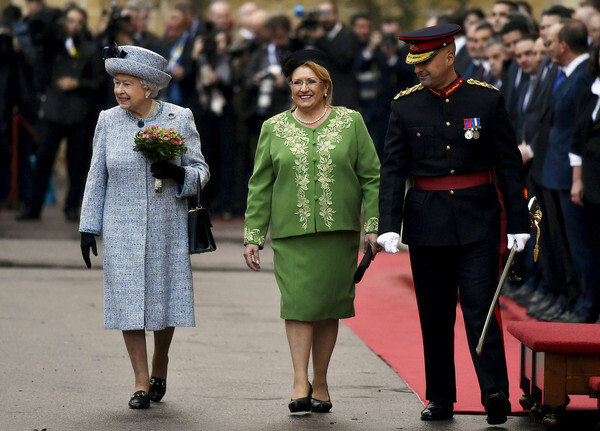 The Queen and duke will be greeted by Malta's Prime Minister Joseph Muscat at the airport and will then receive a ceremonial welcome, attended by President Marie-Louise Coleiro Preca, in Valletta. The Queen’s Malta trip promises to be one of the most emotional overseas visits of her life. Not only will Her Majesty and the Duke of Edinburgh revisit some of their old haunts but the Queen will attend a meeting of Commonwealth leaders for what could be the last time. The Commonwealth, which has grown from seven members to 53 members during the Queen’s reign, is widely regarded as her proudest achievement, and she has only missed two of the biennial Commonwealth Heads of Government Meetings since they were instigated in 1971. But with the next two summits after Malta happening on the other side of the world, the Queen, who no longer travels long distances, may never get the chance to attend another. The next time a CHOGM summit could be close to home will be in 2021, when she will be 95, but only three member states - the UK, Cyprus and Malta – are within easy reach and there is no guarantee any of them will be chosen as the venue. The Queen is expected to be given a rousing welcome by the Maltese people in St George’s Square in the centre of Valletta, where she and the Duke will be received by the President, Marie-Louise Coleiro Preca. On Saturday they will have a chance to return to the Maria Racecourse, home to the Malta Polo Club where the Duke learned to play the sport. They will also take a boat journey across Valletta Harbour, as they did in 1954 when they took the six-year-old Prince Charles with them. A very interesting article where you can also read about Villa Guardamangia, where the Queen lived. The couple will spend three days in Malta for the Commonwealth Heads of Government Meeting, but the villa is in such a poor state of repair that a nostalgic return is out of the question. The Maltese government had hoped to buy the building and renovate it as a tourist attraction, but a drawn-out legal wrangle with its current owners means nothing has been done. The Queen reportedly asked to see the house when she and the Duke last visited Malta in 2007 for their Diamond Wedding Anniversary, but the then owners are said to have refused. She last went inside in 1992, during a State visit. The ceremony to welcome Queen Elizabeth at the start of her state visit to Malta tomorrow has been moved to San Anton Palace because of forecast bad weather, the British High Commission said. The ceremony was due to have been held at the Palace Square in Valletta. The High Commission said there will be other opportunities for the public to participate in the state visit and see the Queen, particularly on Saturday at 11.35am when she will use a traditional Maltese boat to cross from Kalkara to Customs Wharf, Valletta. We can't do anything about the weather, but I had been looking forward to this great welcome ceremony. As I wrote in this post, the Queen looks very tired when she does outdoor engagements these days, she smiles and waves less than she used to and she don't do walkabouts anymore, so I don't hope people get disappointed. ^ Perhaps the welcoming ceremony will be televised anyway, even if it has been moved? I know this has been posted here before, but there are some changes and time has been added. On arrival at 15.25, Her Majesty and The Duke of Edinburgh will be greeted at Malta International Airport by the Prime Minister of Malta, The Honourable Dr Joseph Muscat. The Prince of Wales and The Duchess of Cornwall will have arrived at 15.15 and will depart to follow their own programme. 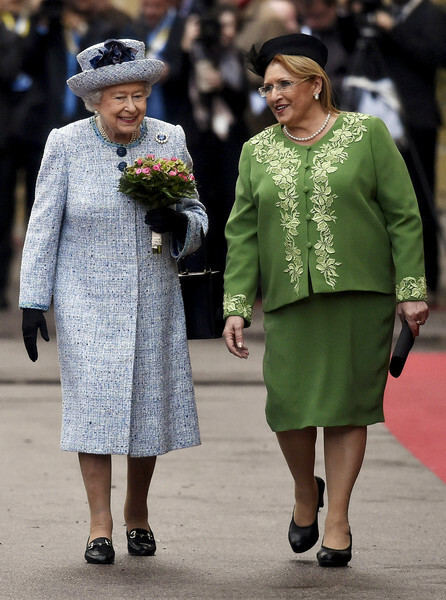 From Malta International Airport, The Queen and The Duke of Edinburgh will travel to the President’s official residence for the ceremonial welcome by the President of Malta, Her Excellency Mrs Marie-Louise Coleiro Preca. As part of the ceremony, Her Majesty and The President will inspect a guard of honour. The Prince of Wales will attend the CHOGM Business Forum and at The Duchess of Cornwall will visit Mdina Glass in Ta'Qali. On Thursday evening The Queen, accompanied by The Duke, The Prince and The Duchess, will attend a State reception hosted by The President of Malta in her honour in the gardens of San Anton Palace. The Prince of Wales, President of The Prince's Trust, will later join guests at an evening reception to mark the launch of Prince's Trust International. At 9.45, The Queen, accompanied by The Duke of Edinburgh, The Prince of Wales and The Duchess of Cornwall, will arrive at the Mediterranean Conference Centre to attend the opening ceremony of the 24th Commonwealth Heads of Government Meeting. The Duke will first visit St Paul’s Pro-Cathedral at 11.35 for a short thanksgiving service and tour, which will include meeting the ‘Farmers Boys’, former Members of The Duke of Edinburgh’s Royal Regiment (Berkshire and Wiltshire), members of the Royal Navy Officers Association and The Friends of the Cathedral, of which he is Patron. Afterwards, The Duke will attend The Duke of Edinburgh’s International Awards lunch at Casino Maltese alongside The President of Malta, patron of the Award in Malta. The Duchess of Cornwall, Patron of Book Trust, will visit the "Read With Me" literacy programme at St Thomas More College Primary School, Zejtun, at 11.50, followed by a drumhead service and wreath laying ceremony at the Commonwealth War Graves Commission Capuccini Naval Cemetery, Kalkara at 12.50. Following the New Heads lunch, The Prince of Wales will visit the Maritime Museum, Vittoriosa, to view an exhibition of the finalists of "Out of the Blue: The Prince of Wales's Commonwealth Environmental Photography Awards" and join discussion with youth delegates. This will begin at 13.40. His Royal Highness will then attend a Special CHOGM Executive Session on Climate Change, arriving at 16.00. At 20.00, The Queen, accompanied by The Duke of Edinburgh, The Prince of Wales and The Duchess of Cornwall, will arrive at the traditional CHOGM dinner at the Corinthia Palace Hotel, Attard. The Prince of Wales and The Duchess of Cornwall will undertake a short engagement in Mdina before leaving Malta. Following private farewells with the President in the morning after planting a commemorative tree, The Queen and The Duke of Edinburgh will visit Heritage Malta, Kalkara. The public will have another opportunity to see The Queen and the Duke as they depart Kalkara at 11.35, travelling across the stunning Grand Harbour by boat to Customs Wharf where The Queen will unveil the Commonwealth Walkway Disc. The final engagement of the State visit will begin 12.10 at Marsa Racecourse, home to Malta Racing Club and Malta Polo Club where The Duke of Edinburgh played as a young man. The Queen and The Duke will view events and present prizes before departing for Malta International airport in the early afternoon and the official farewell. They will leave Malta at 13.15. This is a state visit, but we will not have a state dinner/banquet this time, just the CHOGM dinner at the Corinthia Palace Hotel. When the Queen was in Malta in 2005 (also then on a combined state visit/CHOGM) we had both a state dinner and the CHOGM dinner. The Queen arrives in Malta - live on TVM from 14:00 British time. She has arrived, and looked to be in great form. 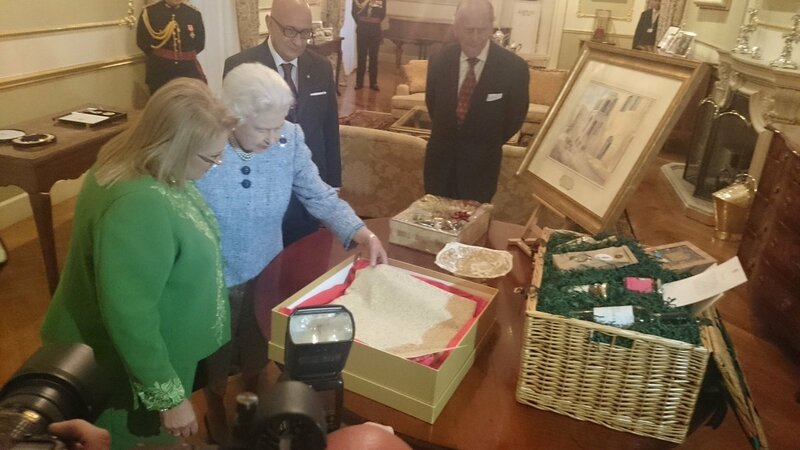 Gifts to and from the President of Malta. 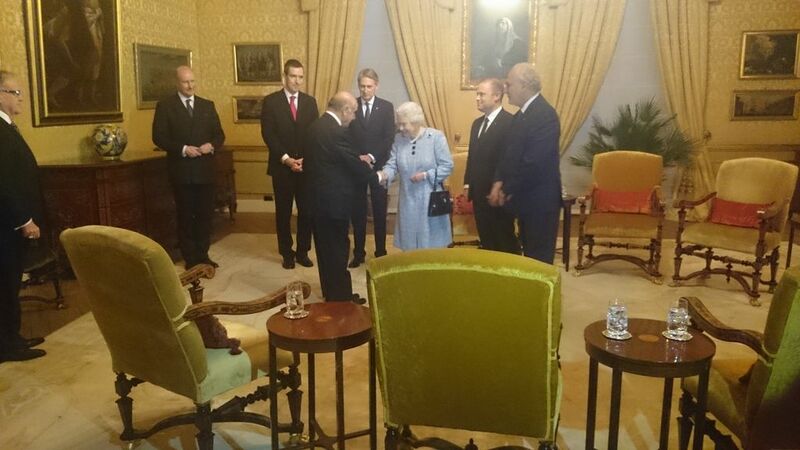 The Queen with the Prime Minister of Malta and other ministers including Philip Hammond. The Queen, Philip, Charles and Camilla attends a state reception in the gardens at San Anton Palace hosted by the President of Malta. 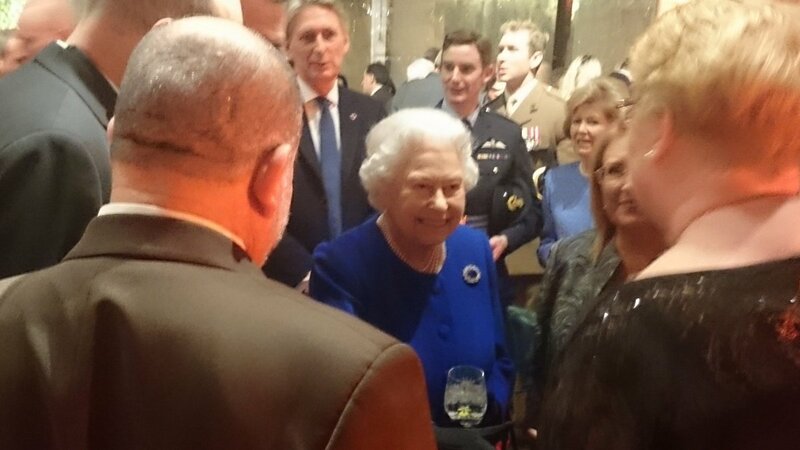 Queen Elizabeth II met old friends and acquaintances during a reception at San Anton Palace this evening hosted by President Marie-Louise Coleiro Preca. The Queen and Prince Philip used to live in Malta between 1949-1951 and have happy memories of the island. 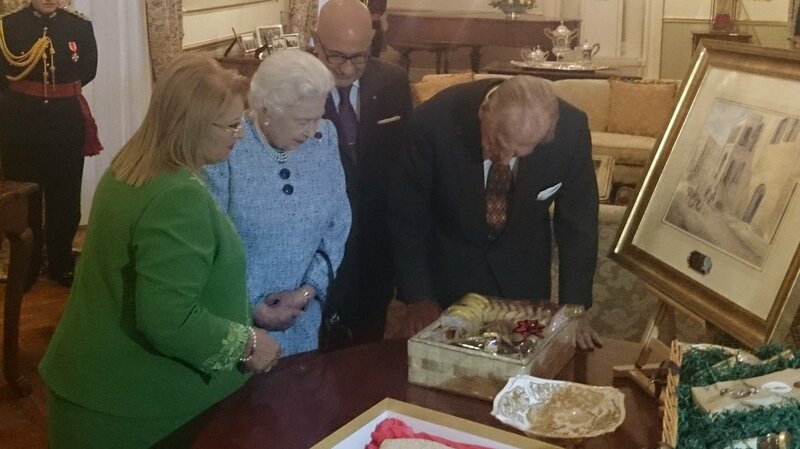 Picture above shows the Queen and the President chatting with Freddie Mizzi, who played in a band at the Phoenicia Hotel when The Queen and The Duke of Edinburgh used to dance there. She looks great and happy as usual. 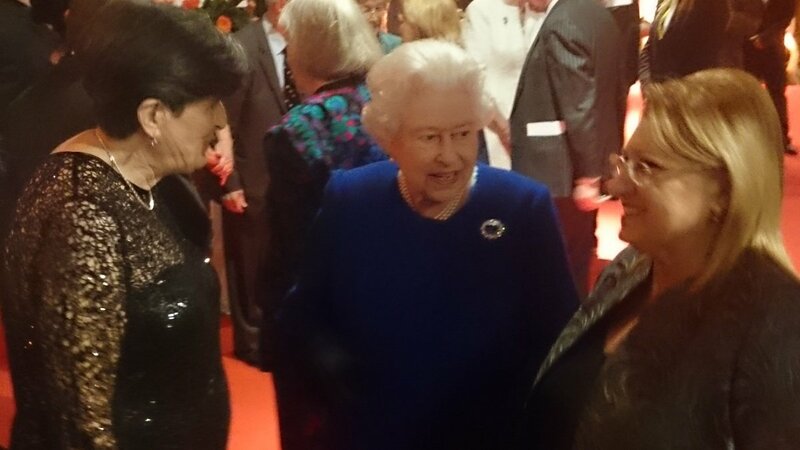 The Queen speaks to Freddie Minzi who played in a band at the Phoenicia Hotel when she and Philip used to dance there. 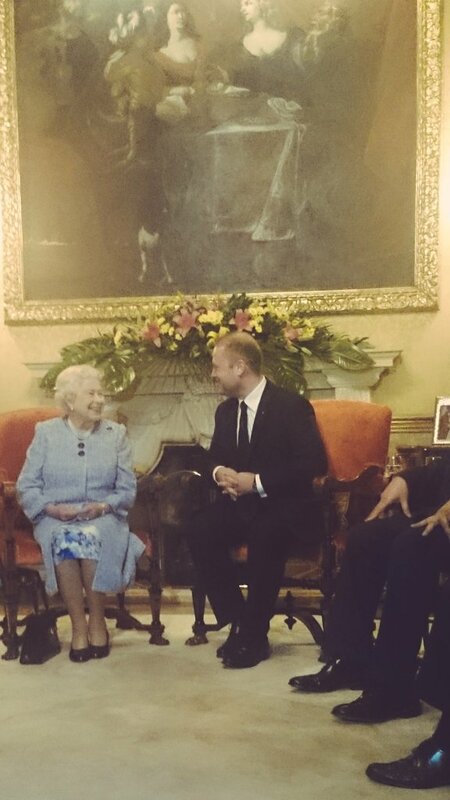 The Queen was according to the Prime Minister of Malta very interested to hear about the NHS Barts Health initiatives in Malta. This picture is from his twitter account. Rain swirled through the sky as the Queen arrived in Malta for the Commonwealth summit, but the air was also filled with a distinct note of melancholy on what is likely to be her last trip to the island that was once her home. The band of 4th Regiment, Armed Forces of Malta set the tone when they chose to play Thanks For The Memory as Her Majesty inspected a guard of honour on her arrival in Valletta on Thursday. 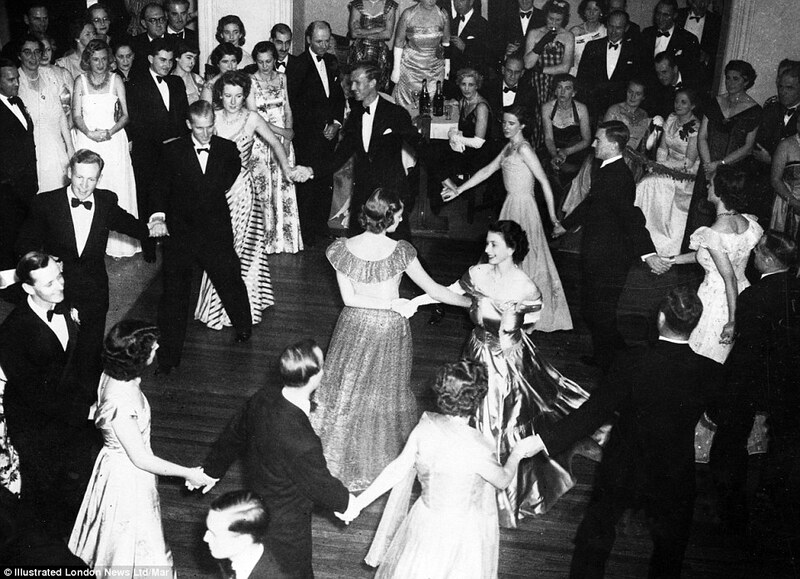 The lyrics of the Bob Hope hit talk of rainy afternoons, of motor trips, of candlelight and wine, sunburn at the shore; the sort of memories, indeed, that the Queen and the Duke of Edinburgh will cherish from their carefree life on the island from 1949-51. But as the tune was played in the courtyard of the presidential palace of San Anton, it was the people of Malta, who so took the young Princess Elizabeth to their hearts, who seemed to be saying goodbye. 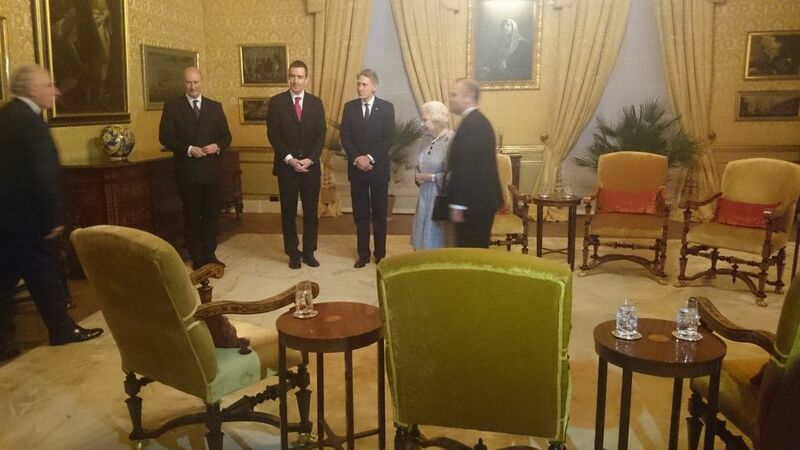 There was more nostalgia at an evening reception at San Anton palace, where the Queen and the Duke were reunited with some old faces from their past. Freddie Mizzi, 81, was a clarinetist with the Jimmy Dowling Band when the Queen and the Duke used to go dancing at the Venetian Hotel in Valletta in the early 1950s. He said: “I reminded her that we used to play their favourite song, ‘People Will Say We’re In Love’, from Oklahoma, and she remembered. The Queen admitted today that the Maltese villa where she stayed with Prince Philip as a young couple ‘looks rather sad now’ after falling into disrepair. The royal couple are visiting the island on a state visit with the Prince of Wales and Camilla for the Commonwealth Heads of Government Meeting. 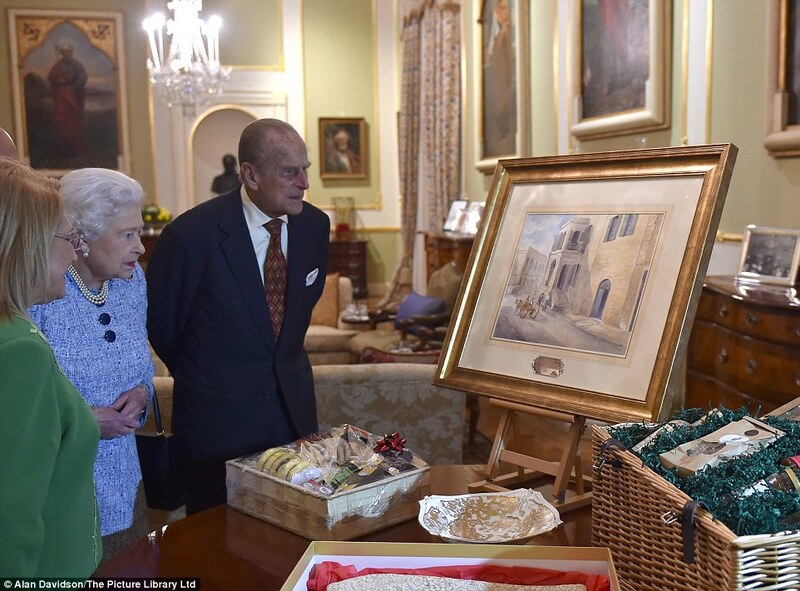 And they received a reminder of their happy times in Malta when presented with a painting of Villa Guardamangia, which is located near Valletta. 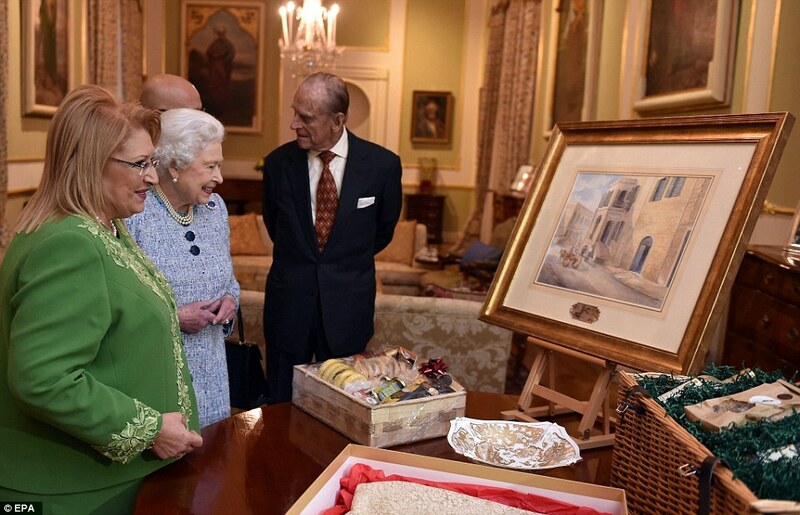 After an official welcome at San Anton Palace, Maltese President Marie-Louise Coleiro Preca showed them the watercolour by local artist Edwin Galea. But the couple both commented on how the villa had since suffered from neglect. ‘It looks rather sad now,’ the Queen said.